Imagine your guests sitting down and ordering their drinks right away. Or letting them watch their food being prepped from their seats in the dining room. Or simply be able to draw on the table and erase it in a blink of an eye. We’re not talking about tableside-tablets. We’re talking about interactive tables that both entertain guests as well as inform operators. A deep interactive dining experience that changes how guests experience their meals and how restaurants run their business. Let us introduce you to a restaurant doing just that – inamo. Inamo is an Asian fusion restaurant in the UK. But food aside, they’ve taken the dining experience to a whole new level. Their interactive tables allow guests to have complete control over their experience while providing the restaurant valuable information on what their guests like and don’t like. They dove into the deep end of restaurant technology and are reaping the benefits of data gathering. Inamo prides itself in having the world’s “first interactive ordering system.” An overhead projection system, created and managed by Ordamo (a sister company of inamo), beams onto the table. Guests can order their food and drink via a visual menu, choose their “tablecloth,” watch their dinner being made, draw on the table surface, play games and more by tapping on their table like it’s a tablet screen. The tables can even be customized for special occasions by showing personal images. The restaurant has been around for almost a decade, and now has expanded to three locations, proving that a deep interactive guest experience is a sustainable business model and not just a cheap novelty for guests. In both cases, it’s important that the technology is both intuitive and easy to use, said Noel Hunwick, marketing director and co-founder of inamo. Inamo’s tech isn’t just about delighting their guests. The restaurant is also able to get real-time feedback from guests as the meal progresses. This is especially great for introverted guests who may be less likely to verbally complain to the wait staff and bring up issues. A silent guest doesn’t mean issues don’t exist, but operators can’t act on those issues if they don’t know about them either. With real-time feedback, inamo allows staff to respond to problems, and improve the guest’s experience before they exit the restaurant. Guests can order food through their interactive menu projected onto their table. inamo also uses tabletop tablets for food and drink ordering. 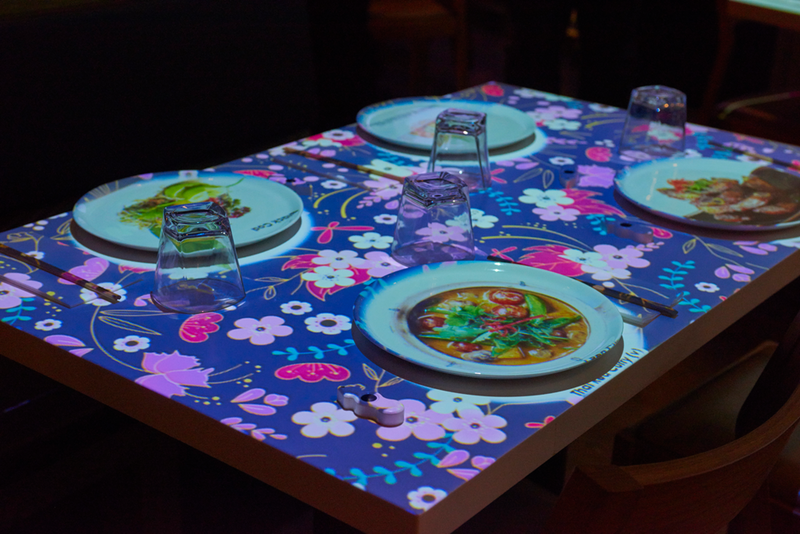 Guests can get previews of what their meals would look like projected onto their plates. Guests can also "draw" on the table. inamo's interactive tables also allow for guest photos to be uploaded and displayed. Guests can also play games, such as pong, memory and puzzles. inamo guests can also choose the look and feel of their "table cloth." “Technology has helped us learn a great deal more about our guest’s wants and needs, getting their direct feedback on our tablet systems and acting on it as opposed to flying blind,” Hunwick said. Data-driven business decisions gives inamo a boost in adapting to what their guests love and dislike. However, capturing that data is as much an ethical decision as it is a business one. It’s important to be up front with guests on what information you’re capturing. “We would steer clear of anything that could be construed as capturing data or information about guests that is not openly transparent or might make anyone uncomfortable,” Hunwick said. She cited bio-metrics as one example of technology inamo would stay away from. When we think of restaurant technology, we often think about the front of house. We think about mobile payment, tablet ordering, reservation or table-wait times and seat management, for examples. But the back of house (BoH) can also benefit from a jolt of technology. Inamo uses the CheckIt system in their kitchens, which has “greatly improved and streamlined” their food safety management. Inamo also has a “chef cam” in their kitchens, letting guests watch the restaurant’s cooks and chefs work their magic. In a poll The Rail conducted last year, 73% of restaurant operators agree that restaurant technology gives businesses a competitive advantage, but almost half of that same group say they’re lagging behind in tech adoption. Cost and integration issues tend to be the biggest obstacles for most operators. But for groups ready to take the plunge, inamo provided a few tips from their own experiences. Not everyone has to be a trailblazer. According to Hunwick, “incremental progressive change” makes the most sense when it comes to technology. Hospitality tech is just becoming an early-mature market, so restaurants should find less headaches to deal with. So, if risk isn’t something you’re prepared for, waiting to see how others find success is a fine strategy. Just don’t get left behind by waiting too long. Choose a specific area of business. Restaurants don’t need to completely overhaul their operation all at once. Nor do they necessarily have to go to the extreme end of the restaurant tech spectrum as inamo has done. It’s best to pick one area of your business to improve upon (i.e., mobile payment or table-side entertainment). Do your research and look for a solution that fits your business needs. Don’t be afraid to make the vendor prove their worth to you. It’s your money and your investment, so the vendor should be able to show that what they do helps you reach your goals. Don’t just take their word for it. Implement in stages. If you can, implementing the new tech in stages can help make the transition easier for staff and guests. Plus, adding new features over time can make for some great marketing content for your blog, regular scheduled newsletter, and press releases.